The new comic tells of an impeding Omnic crisis that the Overwatch team isn't allowed to interfere with. 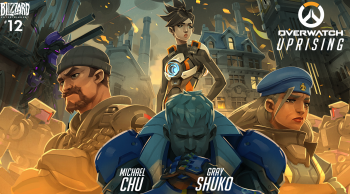 In prepeartion of the big Overwatch announcement Blizzard has teased for next week, it has just dropped a "motion book" comic that takes us back in time to when Overwatch was a big deal. Unlike previously release comics, this one is quite a bit longer and has some fancy animations and sound effects. The comic centers around an impending Omnic crisis taking place in London, with the British PM ordering Overwatch not to interfere. We see Reaper back when he was still Gabriel Reyes, Solider 47 back when he was Commander Morrison, and Tracer when she was first inducted to active duty. It's a glimpse to the past of Overwatch, which may give us some hints to its future. Of course, by the end of the comic Morrison ends up going against the PM, and we even see where Tracer's signature catch phrase comes from. Many believe the announcement will pertain to a new character, a new in-game event, or a new map. I guess we'll find out next week, but for now, enjoy the comic!